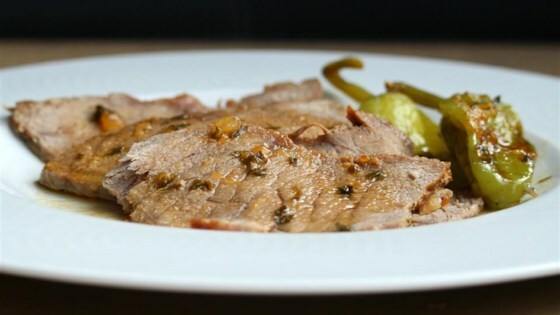 "Slow cooker roast recipe, also called Pepperoncini Roast. Serve with egg noodles or mashed." Place roast in a slow cooker. Form a pocket in the top of roast and place butter, pepperoncini peppers, ranch dressing mix, and au jus mix in the pocket. Substitute beef round or beef brisket for the beef chuck, if desired.